The youth need not experience the abuses of Martial Law to understand it. Students say they can research and read about one of the darkest periods in Philippine history. 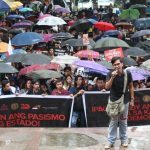 MANILA, Philippines – They answered for a significant number among the thousands who attended the grand indignation rally against the burial of former president Ferdinand Marcos at the Libingan ng mga Bayani on Friday, November 25. 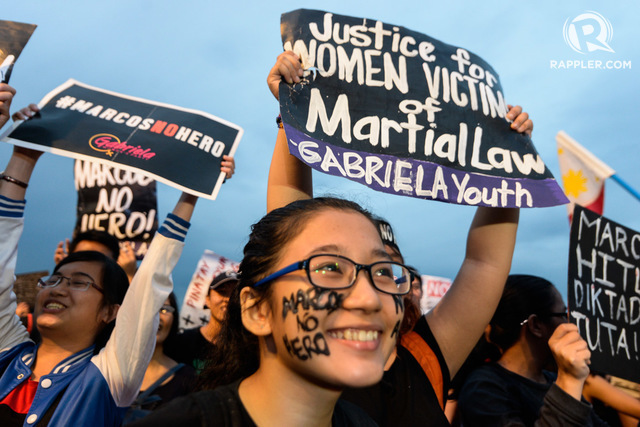 Students from various universities in Metro Manila marched to Luneta with other sectors, saying they share with the older generation the fight to seek justice for Martial Law victims and to make sure one of the darkest periods in the country’s history is not repeated. The message during the Luneta rally: to call on President Rodrigo Duterte to end his alliance with the Marcos family. “It’s important for us to be here, us youth, because our fight is not separate from the fight of other sectors,” said Jann Merlin, a student council member from the University of the Philippines. “Studying history does not only involve remembering the personalities but also understanding why problems in our society exist,” she added. Political science student Enric Alcaide from Adamson University said this is about today’s youth continuing the fight that the older activists fought. “We are the future of the nation, so we need to fight for what our predecessors fought for. We need to continue the fight,” he said. It’s easy for these pro-Marcos people to say that, he said, because they did not share the pain of the victims’ families. “There are those who still can’t find their family members or do not have answers to where their relatives are. It’s painful for them, so they can’t just say move on,” Alcaide said. Meanwhile, Lyceum University of the Philippines student Bettina Oriondo said she felt for the victims of Martial Law because she read a lot about their stories. “Pro-Marcos people want us to move on, but we can’t. I am not a Martial Law victim, but if you listen to their first-hand stories, you’ll cry. I was not among them, but I read, I researched. That’s why I will not let this just slide,” said Oriondo. Janelle Melchor, a student from the Manila Science High School, urged her fellow young people to go beyond what they see on social media. “Let us not just believe what we see on social media because Marcos is not a hero. if they can, just research and they will know the truth that a plunderer is not a hero,” she said. Students from UP in Diliman and Manila, the University of Santo Tomas, De La Salle University, and St Scholastica’s College participated in the rally organized by the Campaign Against the Return of the Marcoses in Malacañang or Carmma. 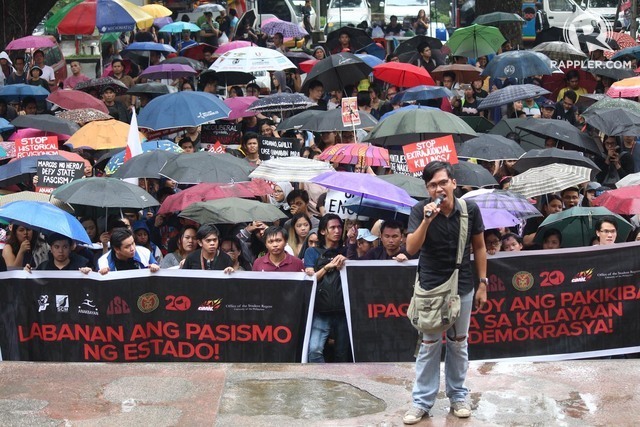 Non-organized students – from schools such as Manila Science High School, Adamson University, and Lyceum University of the Philippines – also joined the rally. 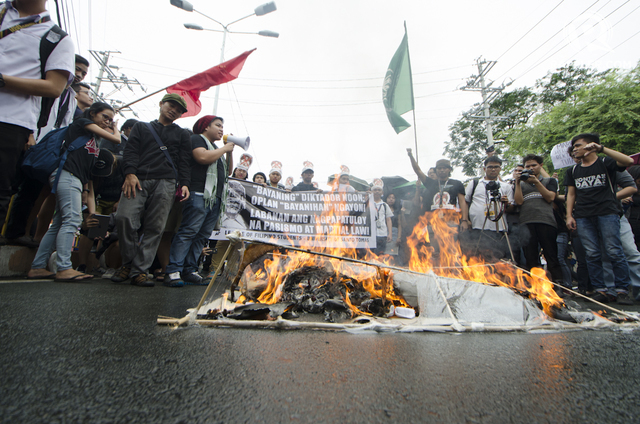 Anywhere from 5,000 to 8,000 protesters from different sectors – women, farmers, laborers, professionals, and students – participated in the Luneta rally, which was held simultaneously with smaller protest activities in key cities across the country. The Friday rally in Luneta was the first of two major rallies denouncing President Duterte’s decision to allow Marcos’ burial at the Heroes’ Cemetery. Another rally is set for Wednesday, November 30, at the People Power Monument. It is organized by the Coalition Against Marcos Burial at the Libingan ng mga Bayani.